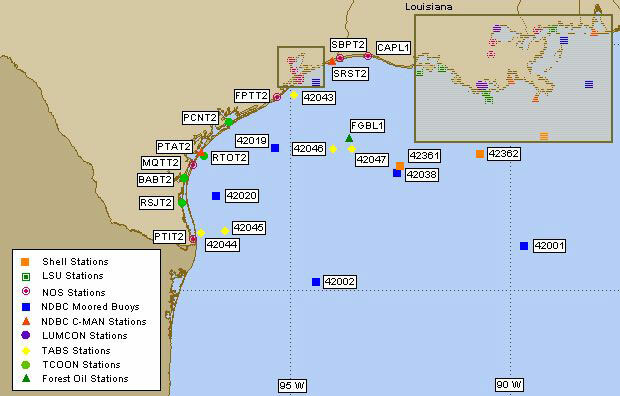 42038 North Mid Gulf of Mexico No recent reports. PTAT2 Port Aransas, TX No recent reports. 42020 Corpus Christi, TX No recent reports. 42019 Freeport, TX No recent reports. 42002 W GULF No recent reports. 42001 MID GULF No recent reports. SRST2 Sabine, TX No recent reports. The PHP script to display this buoy data compliments of Ken True from Saratoga-Weather.org. The data being displayed compliments of NOAA’s National Data Buoy Center.